Steve Colliver began teaching as an occasional teacher in 1984 for former Haliburton and North Shore boards of education and obtained a permanent teaching position in 1987 in Lindsay, Ontario for former Victoria County Board of Education. Steve first served as secretary for the OPSTF Victoria in 1996-98. He was first elected to a released position (vice-president) in Trillium Lakelands Elementary Teachers’ Local in 1999, serving in that position before being elected as Trillium Lakelands Elementary Teacher Local President in 2001. He remained in that position for eight consecutive terms, until he retired. Steve worked diligently as a member of the local’s CBC team for 16 years; 14 of those as Local Chief Negotiator. He is proud of the building of TLETL office as an advanced, eco-friendly, one-of-a-kind; local building that highlighted the local’s leadership, innovation and forward thinking. 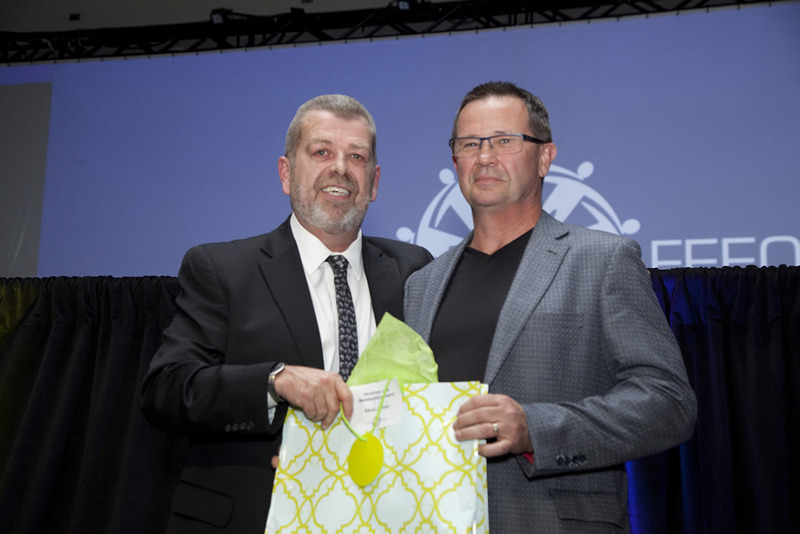 As a dedicated local leader, Steve attended every ETFO Annual Meeting up to and including the 2015 Annual Meeting as well as every ETFO Representative Council Meeting from 1999 to 2015. He enjoyed working as a member of the ETFO Selection Committee for Standing Committees, a member of the ETFO Representative Council Steering Committee and as a member of the ETFO Professional Relations and Discipline Committee sharing his expertise and passion with others across the province. Steve remembers having his children accompany him and his wife to more than a decade of Annual Meetings and that they actually believed that this was a “normal” part of a summer vacation. Among the other career highlights, he recalls the significance of pioneering collective agreement language that protects a teacher’s individual right to determine the use of their own prep time and being grieved (twice) by the employer for protecting members’ rights to adhere to the language of their collective agreement. Member defence was always a key focus for Steve. Steve is honoured to be the recipient of the ETFO Honorary Life Membership.